THE LATEST Scotch whisky export figures delivered signs of recovery, writes Leon Kuebler for WhiskyInvestDirect. Official HMRC figures for January-March 2016, as reported first by WhiskyInvestDirect, were the best Q1 numbers for exports of Scotch whisky since 2013. The improvement in Scotch whisky’s Q1 figures confirms the conclusion drawn by WhiskyInvestDirect from the 2015 data that the decline in Scotch exports is slowing. A total of 70.3m Litres of Pure Alcohol (LPA) – the equivalent of 240m bottles of Scotch – was exported overseas in the first three months of 2016, worth a sum of £792m. This represented a rise of 2.5% in volume compared to Q1 2015, while value declined by 0.1% over the same period. The most striking changes in Scotch’s 2016 Q1 export figures came from the largest market for Scotch by value, the United States of America, and the largest market by volume, France. In the first three months of 2016, exports of Scotch to the United States rose by 8.9% in value, despite a fall of 8.2% in volume. In France, the opposite trend was visible; shipments dropped by 5.7% in value, despite an increase of 4.9% in the amount of whisky sent there. These numbers suggest that the move towards premium bottles in the United States – and value products in France – is continuing. The GDP growth rate of France for Q1 2016 was better than forecast, whereas the US economy showed signs of slowdown. Yet, as the Wall Street Journal notes, France’s economic output has only just reached the level achieved during the global financial crisis in 2008; something which the United States had already achieved in 2011. Neither the French, nor the American markets for Scotch have been immune to these crises. As the above chart shows, the American market for Scotch has historically been significantly more valuable than that of France. 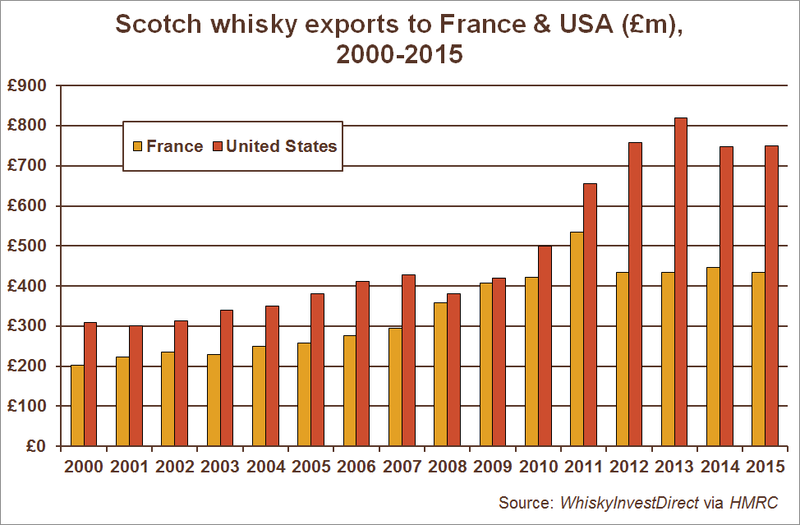 Yet in the years immediately following the start of the financial crisis in 2007, exports of Scotch to France were almost equal in value to those dispatched to the United States. The gap in value between these markets only re-appeared in 2012, when the French economy began a three-year long period of stagnant growth. Seen in this context, it would appear that demand for Scotch whisky still remains strong in both France and the United States. In the case of France, it would appear that continued slow growth has not deterred consumers from buying whisky – just, at present, from spending as much on Scotch per bottle. Similar trends are visible in Spain, the Eurozone’s fourth-largest economy. Like France, Spain posted better-than-expected GDP growth in the first quarter of this year. This year, Spain, the 5th largest market for Scotch by value, received its Q1 highest shipment of Scotch in since 2010. More money also was spent on Scotch in Spain than in any Q1 since 2011 in the process. 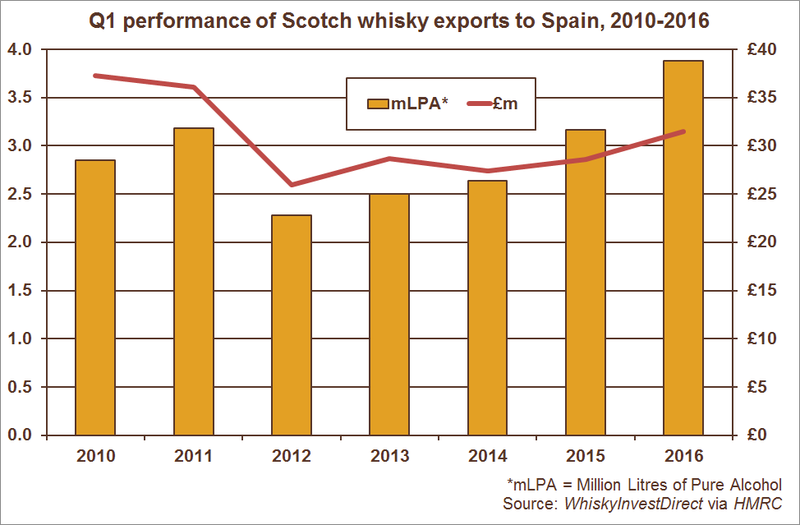 However, the faster growth in volume relative to value over the last two years suggests that the recovery of Scotch in Spain is also being driven by less-expensive products. Elsewhere, the impact of Xi Jinping’s crackdown on corruption continues to be obvious in the amount of Scotch exported to China and its surrounding countries. In Singapore, which traditionally acts as the main supplier of Scotch to China, there were large increases in the value and volume of Scotch imported in 2016 Q1 compared to the previous year. Yet despite steady growth in the last two years, imports of Scotch are still half of the figure reached in 2013, when the campaign against Chinese official corruption was launched. News from Taiwan, the 4th most valuable market for Scotch, was more encouraging. Q1 shipments to Taiwan were up by 3.9% in value on January-March 2015, despite the overall amount of whisky sold dropping. In doing so, the market for Scotch remained resilient in Taiwan, which has experienced a sharp economic slowdown in 2016 so far. However, economic turmoil in several other important countries was reflected in the amount of Scotch imported in the first months of 2016. Continued slow GDP growth in South Africa, the largest Scotch whisky market in Sub-Saharan Africa, saw arrivals of Scotch drop by 38% in value compared to Q1 2015. Scotch exports to Brazil were also adversely affected in 2015 by that country’s sharp recession. 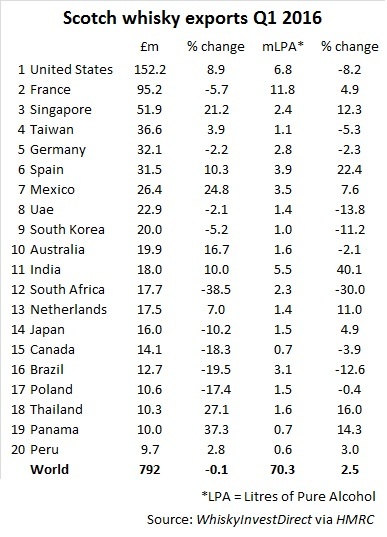 Recent reports suggest that Brazil’s economy has shrunk for fifteen consecutive months. Given this context, the double-digit fall in the value and volume of Scotch sent to Brazil in Q1 2016 compared to the start of last year is perhaps unsurprising. Despite Brazil’s woes, Scotch exports to Latin America were up by 4% in both volume and value, due to strong performances from Panama, Peru, Chile, Paraguay and Argentina.